Speaking of The Sidewalk Cafe and touring with The Mountain Goats, Jeffrey Lewis is playing Sidewalk tonight (Jan 3) at 11. Jeffrey is also playing a Rough Trade showcase with Basia Bulat at Joe’s Pub on January 10th, and a record release show at Mercury Lounge on January 30th. 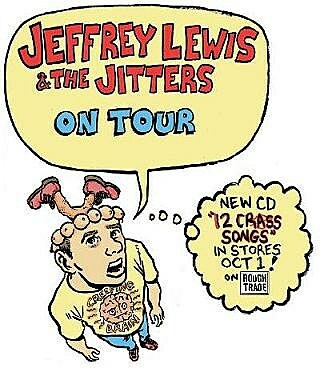 The record being released is called “Jeffrey Lewis: 12 Crass Songs”. It’s out now in the UK and Europe (pictured to the left), but won’t be released to US stores until January 29th (on Rough Trade/Beggars). In February, Jeffrey is then going out on tour first with Super Furry Animals, and then with The Mountain Goats. Exact dates below…. Feb 2008 – Jeffrey Lewis US tourdates solo acoustic opening for Super Furry Animals (to be confirmed), then the full Jeffrey Lewis Band tours the West Coast opening for The Mountain Goats! (Jeff Lewis Band is currently hoping to fill in the below off-days with additional shows! Check his tour dates page for the latest (although he doesn’t currently list the shows at Sidewalk or Joe’s).